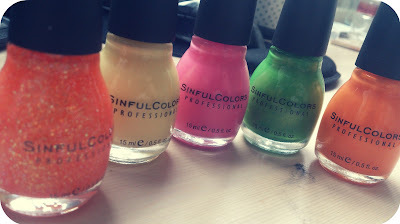 Like many Girls, I have a never ending obsession with nail polish, and it was not helped when I spotted some Beautiful Polishes by 'Sinful Colors' when I was shopping lately! 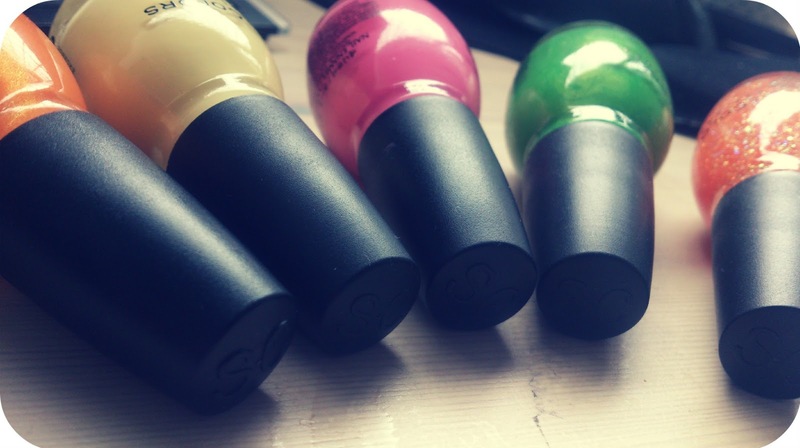 The shades are (top image left to right) - 'UFO', 'Uniciorn', 'Pink Forever', 'Happy Ending' and 'Cloud 9'. The Polishes come in a lovely round bottle which is easy to grip. This may seem like a strange thing to say but there is nothing worse than having a fiddly shaped bottle to try and hold on to when you are painting your own nails! The lid is sleek and black and has 'SC' embossed onto the top - very nice!! This is shade 'UFO' it is a beautiful sheer orange glitter shade with specks of round and micro white and iridescent glitter which glow blue and green in different lights! I have Put UFO on top of Sinful colors - Cloud 9' in this image, but it would also look brilliant over a black polish! The polish glides on effortlessly, which, for a glitter, is lovely! A lot of glitter polishes can be gloopy and hard to apply, but that is not the case with 'UFO', it looks lovely with one coat and would look even more dazzling with 2! This is 'Happy Ending' and as much as I hate the name, I cant deny the amazing-ness of this shade. It is golden-shimmer in bright-green-apple-perfection and although I don't usually go for green, I would happily make an exception for this! I used 2 coats of the polish and it applied smooth and sleek. This shade would look perfect on toes in the summer-time teamed with some white sandals for maximum 'wow' power! 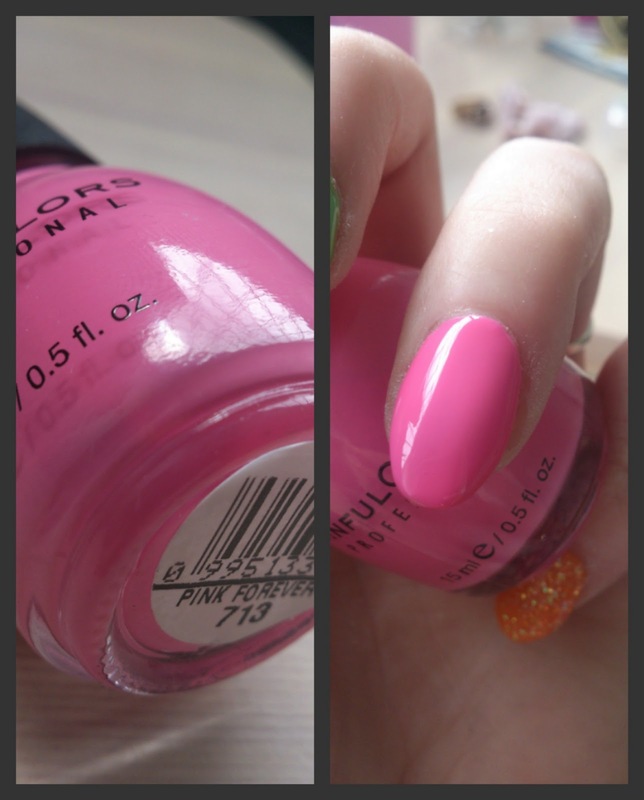 Say hello to 'Unicorn', a shade that is as cute in the colour department as it is in the name department! This polish was a little harder to work with as it did apply a little streaky with 2 coats, but after 3 coats it looked sleek and perfect! 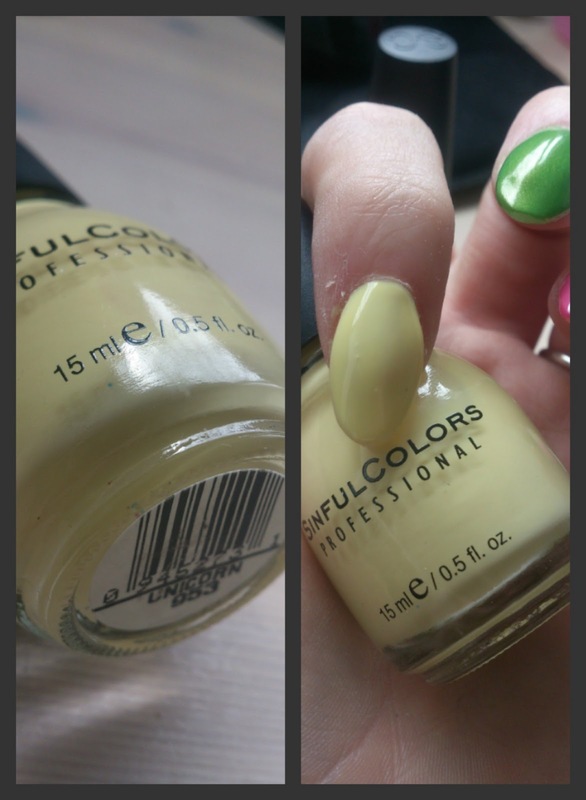 Yellow shades can be daunting for some, but this shade has the perfect balance of milky colour so even the fairest of skin tones can pull it off! 'Pink Forever' - need I say more?! This shade is as gorgeous as it gets and left my fingertips feeling Perfectly pink & preened! The polish is a wearable creme 'barbie pink' without shimmer, which applied opaque with just one coat! I applied 2 coats for extra strength and it looked glossy and just beautiful. This is my favourite of the bunch and when wearing it you really will feel as though on 'cloud 9'! 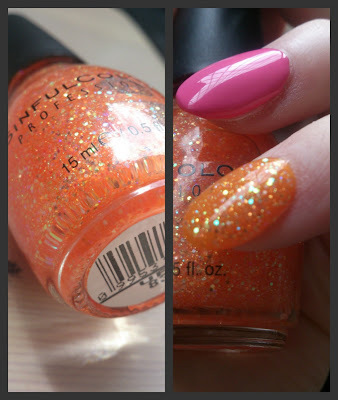 This is a beautiful shade of tangerine with a golden glow which is perfect for summer-time! It is quite sheer so you will need to apply 3-4 coats for full opaque-ness, but it brushes on smooth and clump free and dries in next to no time!